What do used stock FIT rims go for? I've only had my base fit w/15" wheels and wheel covers 2 weeks...yet already wish I had 16" Sport Rims. Not enough to seek a set now, but I probably will be doing so when my first tires start to wear out. Anyway, back on topic: I'd like to hear what you sold (or bought) used Fit Sport rims for, so I'll know whether to lust for or suppress my thoughts of them. 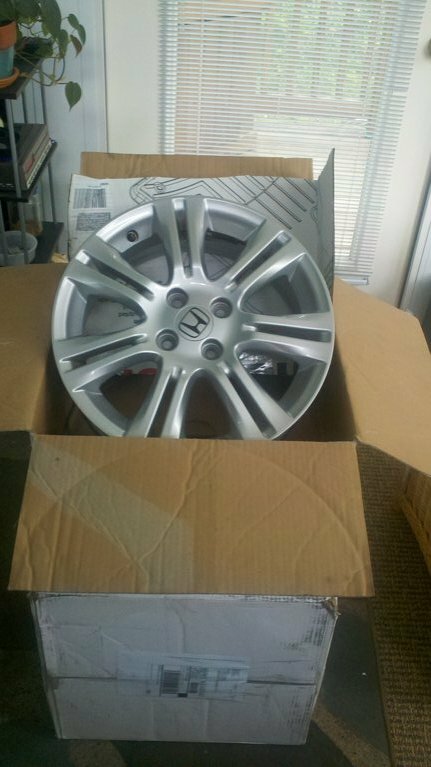 I bought a like new set, (minus TPMS) from a former member for $400 shipped. yah, the 09-11 wheels are a lot better looking imho than the '12-'13. go for those. the ad was going for 500local/650 shipped minus any extra's in freight. and no these are no longer for sale. im not scraping for cash. the reason why i put them up for sale is there were interest and coincidentally i dont like the '12 sport wheels. so i took picts, prepared boxes even, and put them up for sale to help someone who wanted them. well, no takers so went to storage where it will stay there until the day i sell the car. dealers like factory bits so no big deal. pay if you want play. that is just part of modding a car. (well, that's if you want to call getting standard stock boring wheels a "mod"). I like the '09 style better than the '12's like you as well so if I were to replace, i'd go aftermarket with something decently lighter than stock. Probably a smart move to hang onto them if you are planning on selling the car at some point, then again, you could drop them on the '09 when you sell that and maybe get a few more bucks. Maybe even give the buyer an option of which wheels. As for the Servers, they were about 6 months to 1 year old back in 2002 when the company folded. The Dot.Com era didn't last that long... but man was it fun. Beer and Ice cream in the fridge at work, some late hours with insanely hard work, but lots of good people and lots of good times. I've seen them go for anywhere between $400-700 with tires. Obviously it's depedent on the condition of the tires and wheels. From what I've seen the 2012-2013 wheels are a bit more sought after so they will probably be on the higher end (and they're obviously newer). Will Skunk2's from GD's fit GE's?